Celebrate National Ice Cream Day on the Cheap – Wichita By E.B. July 16 is National Ice Cream Day. That means it is your chance to go out and enjoy free or discounted ice cream all over Wichita. 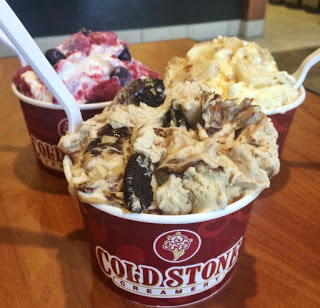 Cold Stone Creamery: Get a BOGO deal on Creations when you sign up for their rewards program on their website. McDonalds: Download the McDonald’s App and get a coupon for a free vanilla cone. Wendy’s: Small Frosty’s are 50 cents for a limited time. See more details on Twitter. Baskin Robbins: They will be giving away freebies if you download their mobile app. Dairy Queen: Join the Blizzard Club for a BOGO Blizzard coupon. PetSmart: They are celebrating National Ice Cream Day by offering a free Doggie Ice Cream Sundae, fun digital keepsake photo, tours, giveaways & more. This event takes place from 9 am – 9 pm at participating PetSmart PetsHotel locations. See more details on their Facebook page. Enjoy this foodie holiday. With all these cheap deals, I don’t have to scream, you don’t have to scream, we all don’t have to scream for ice cream.